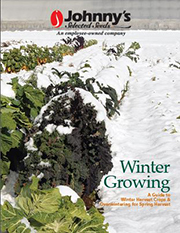 Quick Hoops ™ made of bent steel conduit or EMT (electrical metal tubing) are positioned over crops to be overwintered. 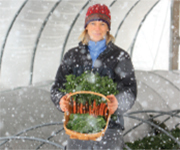 We developed the Quick Hoops™ Low Tunnel Benders specifically for creating hoops that support heavy winter snow loads. We have found that hoops made of other materials, such as wire or PVC, fall short in this regard. The hoops are covered initially with row cover (Agribon-19 or heavier) to extend the crop into the fall. These coverings protect the crop from frost, but allow them to respire and self-ventilate as temperatures fluctuate throughout the day. After a few frosts, and once the chance of warm days has diminished, a layer of 4-mil (100-micron) greenhouse film is added on top of the row cover. 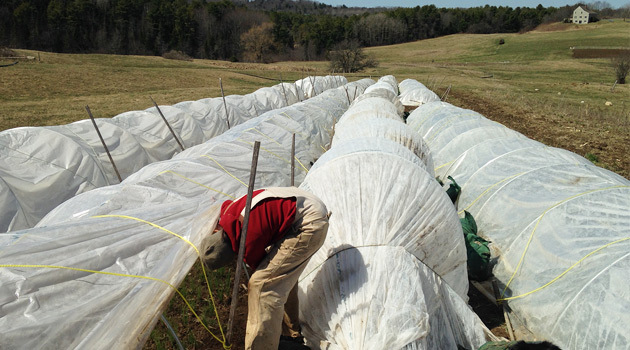 If warm weather does occur after the addition of plastic, the low tunnels may need to be manually ventilated by lifting the sides, to prevent internal temperatures from getting too high. In the dead of winter, the tunnels will effectively be sealed shut by the snow load on top. Following the winter solstice, the tunnels may again need to be vented intermittently, to prevent overheating as days grow longer and warmer. 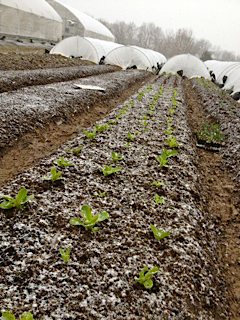 After the danger of frost has passed, the plastic can be removed completely, with the row cover remaining in place to protect the crop until it is time for early-spring harvest.